In the application’s field, will be displayed to set only the previously selected fields in the menu Fields positioning and the virtual fields previously created in the application. They are fields created with the creating field interface, to attend the developer’s needs making a lot of functionalities possible to the developed application. 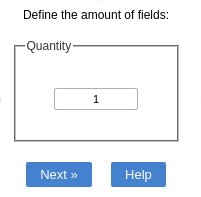 The virtual fields are not inserted in the database after its creation. To create a new field in the application, you just need to access the menu ‘Fields’ and click in the item ‘New Field’. Every field created through this process are considered by Scriptcase as Virtual Fields. After that, the initial screen will be displayed, where it will be possible to define the quantity of fields that will be created in the application. 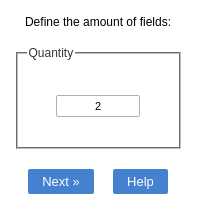 In this option, you can define the quantity of fields that will be created. Turning the process of creating fields way more dynamic and saving time in the creation of them. The field’s inclusion allows the developer to set immediately the type, name and label from the fields. In this way, you can create diverse types of fields at once. Type Informs the type of the field that will be created in the application. Only the supported types are listed by the application. 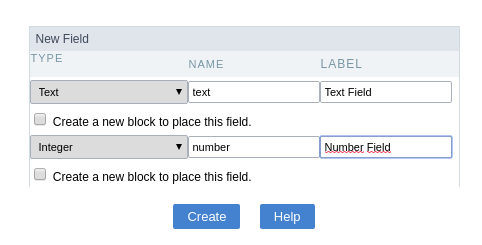 Name Allows you to define the name of the field in the application. Label Defines the title that will be displayed in the field when the application is executed. The terminology used in the interface is fundamental to the system have a good usability, we should use names and familiar terms to the final user of the application, instead of using terms from the system.